Getting Married | CWF GROUP INC.
You’ve probably put a lot of thought into the flowers, food and photography for your big day. But have you given any thought as to your soon-to-be family’s financial well-being? Money Talk – Almost two-thirds of couples wish they had taken more time talking about their financial situations and goals for the future with their partner before getting married. Buying A New House – What can we afford to spend on the purchase of a new home? What are our financing options? What might be best for us? Responsibility Towards Your Spouse – How much Life Insurance should we have? Who should it be on? How much of it should be through my work-group insurance? Insurance can also be used to address individual legacy desires. Using life insurance to offset competing interests, “estate equalization”. Marriage Contract – dealing with family property and personal assets. Full disclosure of your financial situations, as well as receiving independent legal advice and signing free of any duress are just some of the things that should be addressed. Insure your wedding rings -Make sure your new bling is protected from loss by insuring it. If you have homeowner’s or renter’s insurance, you can get a rider to cover your jewelry. Create a new budget -Now that you’re a family of two, you’ll need to set a new spending plan. You’ll get to split the cost of utilities, but the grocery bill will probably increase. Make a list of all income and expenses and see where you can cut back if need be. Pay off debt -A wedding is a very expensive event and you may have turned to credit cards to help pay for it. Whether you have a serious shopping compulsion or student loans, if you have not already had the full debt disclosure discussion, do it now. Talk honestly and openly about your debt and decide on a repayment plan. Take a vow to forsake all other debt, except for your home mortgage, as long as you both shall live. Assign financial tasks but share financial responsibilities -Someone has to take out the trash and someone has to pay the bills. Determine who’s in charge of paying the bills, monitoring investments, filing paperwork, and other financial tasks. The other person can clean up after dinner. Once a month the two of you should dedicate two hours of open communication about your financial situation. Review monthly bills, level of savings accounts and progress towards your short and long-term financial goals. 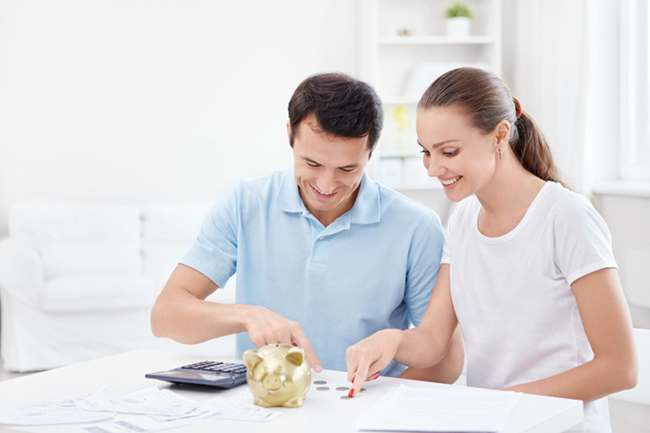 Discuss your financial tolerance -Are you a spender while your spouse is a saver? Does your spouse want to invest in bonds, whereas you’re interested in stocks? Get to know each other’s personal finance personality and tolerance for financial risk. You may also want to set some financial ground rules like determining a spending limit without first obtaining your spouse’s consent. Change the beneficiary on your insurance and update your wills -Contact your company’s human resources department or your Financial Advisor to list your new spouse as the beneficiary on your disability and life insurance. Don’t forget to do the same for your RRSP, bank accounts, etc. Update your documents with your new surname -Take your marriage license and any other required documentation to the nearest government office and get your new identification card if you’re changing your name. Review how your new marital status will affect your taxes -If your new spouse has children, you may want to change the amount of taxes withheld from your paycheck to reflect the new dependents. Start an emergency savings fund -You’ll want to be prepared if and when the car needs new tires or the roof springs a leak. By setting aside money each month, you’ll accrue savings for surprise situations. Keep this account sacrosanct. Do not violate it for anything but emergencies. Set new financial goals -Buying a home, starting a family, sending the kids to college, and retiring are all exciting life goals – they’re also expensive ones. As a newly married couple, talk about what you want in life and determine what financial steps you must take in order to get there. Through our Advice process we take prospective clients through a Discovery Process that helps them (and each other) better understand the issues they are facing. CWF advisors works with the family to draft an actionable Financial Plan based on their unique goals and desires. We then help you execute each action item in a timely and efficient manner.